Whether you own 50 acre or 1,000 acre property, there will always be a number of projects to be completed, ranging from mowing, material handling, tilling, seeding, and much more. When these projects become overwhelming, it may be time to look for help in the form of a utility tractor, which can be the best friend of a property owner looking to do ranching, hobby farming, or just general lawn care. With so many available utility tractor options out there, it’s very important to understand exactly what types of features are must-haves for the projects that it will be tackling. Once the general need for a tractor has been identified, it becomes time to buy. 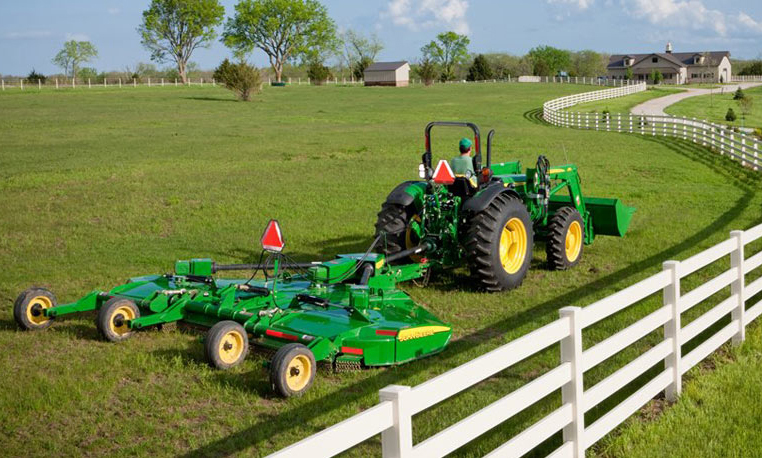 While many questions can and should be asked before buying a John Deere utility tractor, we’ve identified six that we believe are essential to ask when going to a dealership with purchasing in mind. The golden rule when it comes to deciding on necessary power for your utility tractor is to always purchase a tractor that has a little more power than you think you need. Having a tractor without enough power will leave you unable to handle all of the desired chores, while a tractor with too much power will waste fuel. 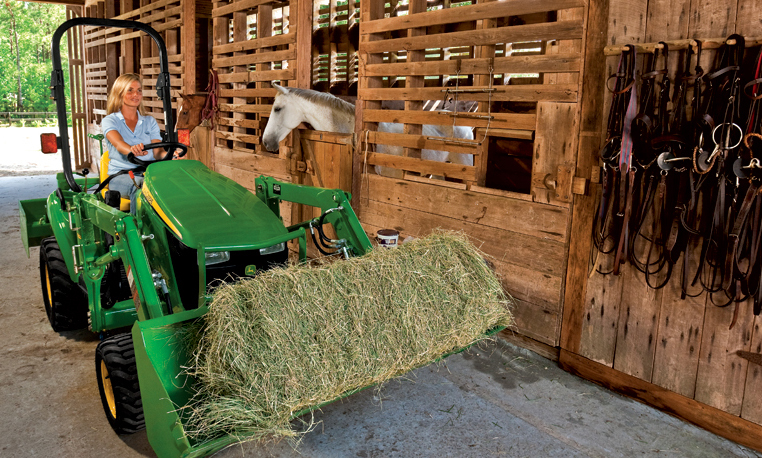 While horsepower is a good place to start looking while evaluating, don’t overlook the tractor’s power take-off (PTO). This is the measurement used to describe the rotating shaft in the back of the tractor that’s responsible for transferring power from the engine to the implements (such as cutters) that will be getting the job done. Generally, a tractor’s PTO will be 15% less than its horsepower. 2. What type of transmission is best for you? 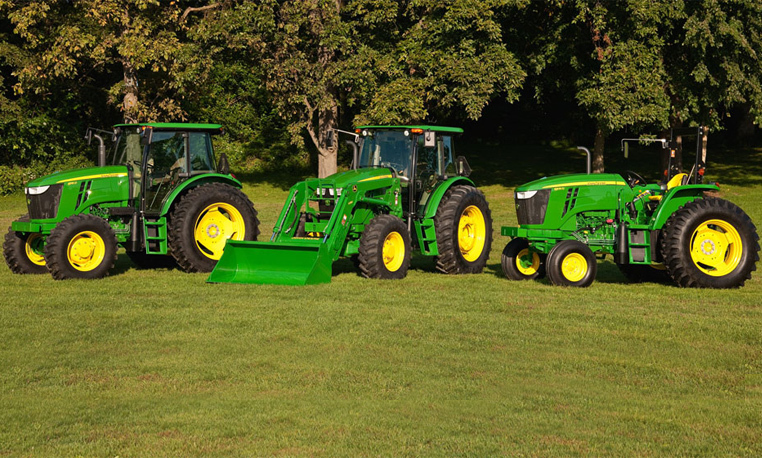 Transmission choices for John Deere utility tractors are very similar to those available in most of today’s cars and trucks. The range of available transmissions can help shape what type of tractor you should consider. There are a few different gear-driven manual transmissions available (found on most utility tractors), and they are considered the most efficient and reliable transmissions. Non-synchronized transmissions require stopping and clutching between gear changes and are well-suited for mowing, plowing, or other jobs where speed changes will be limited. Partially synchronized transmissions allow operators to clutch and shift between speeds without stopping the tractor and are easy to operate over a wide range of conditions. Fully synchronized manual transmissions allow operators to clutch, then shift on the go between any speeds. Hydrostatic transmissions are best-suited for less-experience tractor operators, using hydraulic pressure, not gears, to propel the tractor. These transmissions typically feature pedals or levers to control direction. PowrReverser is great for work that includes a loader. An orange lever to the left of the steering wheel allows operators to change direction from forward to reverse without stopping or clutching. 3. Do you need two or four-wheel drive? If you will be using your utility tractor primarily for light-duty mowing, standard two-wheel drive will be the best option. However, for heavier chores across rolling ground, four-wheeled drive should be considered to provide extra traction and power. 4. What types of implements will you be using? 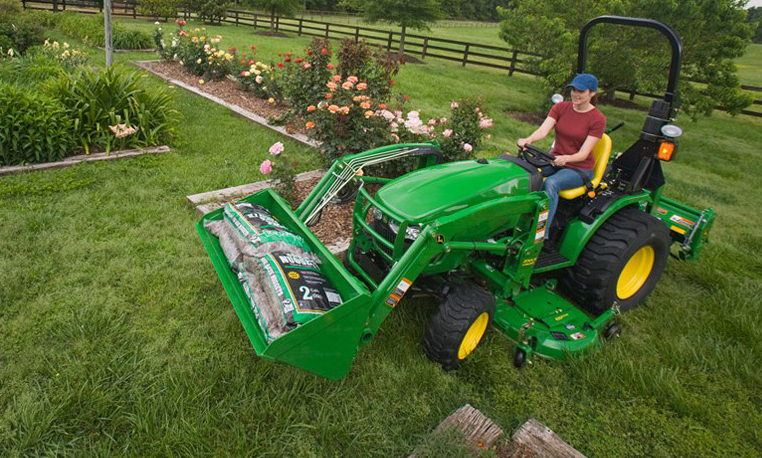 One of the most appealing aspects of investing in a John Deere utility tractor is its ability to do more than mow the lawn. These tractors can run be equipped with a wide variety of attachments to help operators get the job at hand completed efficiently. It’s important to first identify what types of attachments you will be running on your tractor, then evaluating hydraulic capacity. The hydraulic system runs everything from the power steering and brakes to loaders, backhoes, and other attachments. These systems typically come in two forms; an open-center and closed-center. The open-center constantly circulates hydraulic fluid, meaning faster response times when the loader or other hydraulic implement is lifted. The closed-center system remains in an idle state unless it’s called upon to power and attachment. 5. What are your comfort and convenience requirements? 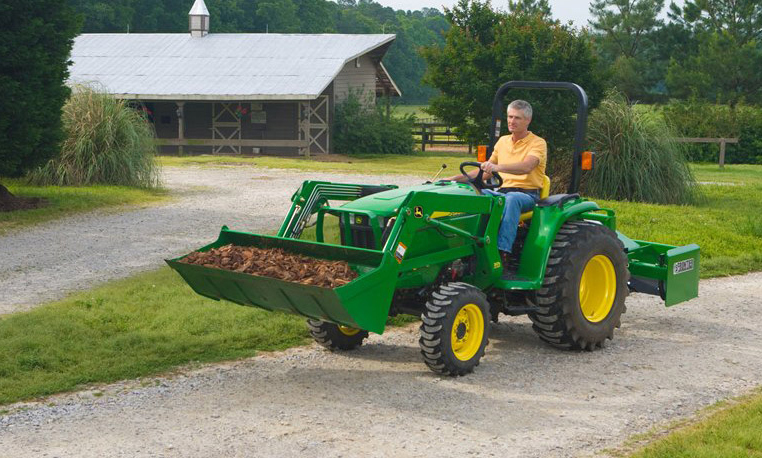 If you plan on spending several hours a day or week on the tractor, don’t overlook its comfort and convenience. 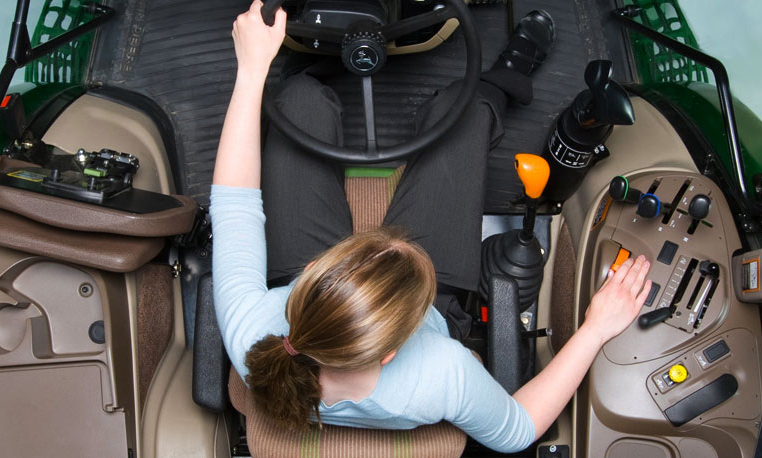 The only way to make sure the tractor is fit to your standards is to climb in and take a test-drive before purchasing. Seat comfort: Is the seat itself comfortable and does it fit your range of adjustment needs? Controls: Are the most commonly used controls in an easy-to-reach location? Operator station: Do you want a closed cab station for cold weather working? 6. How much time will you have for scheduled maintenance? Let’s face it, maintenance is a necessity. That’s why this is another important factor to consider before purchasing a utility tractor. Before you buy, make sure you understand what types of routine maintenance it will require and how often. Make sure you know how to check the engine and hydraulic oil levels, how to locate oil and air filters, and how to reach the battery. 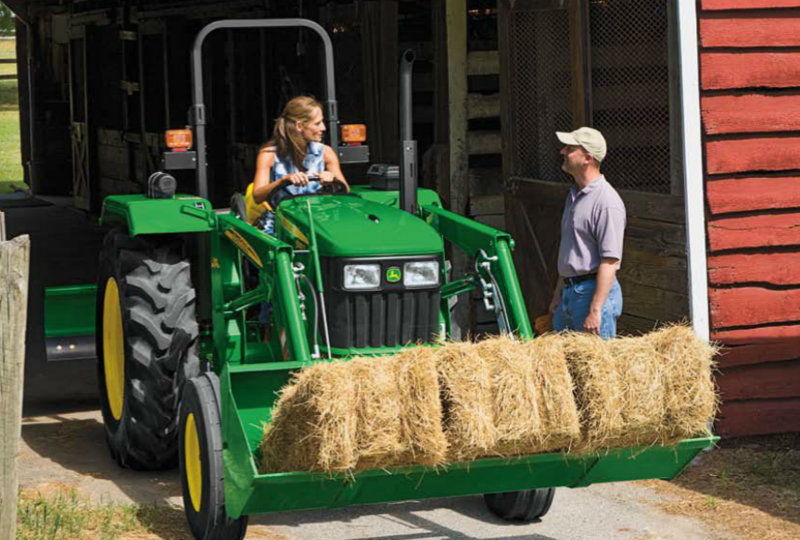 Don’t forget that the cost of owning a tractor is often more than the price tag indicates. Be sure to take into account the amount of time and money it will take to maintain the tractor in case you decide to sell it in the future. A well-maintained tractor will have a higher re-sale value. Hopefully these six questions will provide a good starting point for those interested in buying a John Deere utility tractor. Feel free to let us know any questions you ask before purchasing by connecting with us on Facebook or Google+!